Hello! Happy Monday! It was a happy mail day for me because "Quilter's Connection" sent me a bundle of copies of their Spring 2016 issue which has my "Modern Circles Rainbow Quilt" in it. Naturally I would like to host a giveaway here on the blog to celebrate my first official pattern published in a magazine. 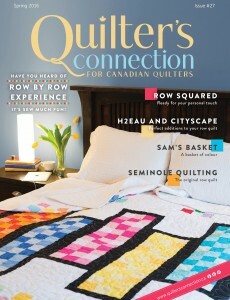 "Quilter's Connection" is a Canadian Quilter's magazine. I have a thing for sewing curved seams lately and I always love a rainbow. My pattern gives fabric requirements for both this baby quilt and a lap/twin sized quilt. If you are new to sewing curved seams please check out my YouTube video to see how easy this actually is! Please leave me a comment here on this blog post to enter to win a copy of the magazine! :) Open to everyone. I will choose a winner at the end of the day on Wednesday March 9th, 2016 and the winner will be emailed and announced on the blog. If your email is not public on your account please make sure I have your email address in the comment so I can contact you if you win. For another chance to win please feel free to follow, like and comment over on this photo on Instagram. Giveaway is now closed: Comment #30 Ioleen is the winner! Congratualtions Ioleen!